You are moving, and you are stressed out. You know you are going to have to rent a truck and figure out a schedule to load and unload it, and you just do not have time for all that. Your new house is not going to be ready when you have to be out of the old one, so you have to store your stuff for a while and then you’re going to have to move it all over again. It’s enough to give a person a headache just thinking about it. 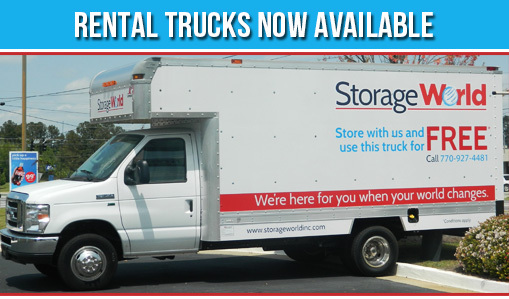 You have the storage woes, and Storage World on Wheels has the answer. Safety is one of the main things you want to think about when you are looking for self storage – and that means safety both for you and for your items. Storage World on Wheels offers the safest Atlanta storage facilities, and your security is one of our main concerns. To enter the gates of Storage World you use a secure code, so there are no unwanted visitors to your unit. Storage World gives you a free lock for your unit at the time of move in and it is yours to keep, so the unit is not accessible unless you are present. Your items will stay safe and secure while they are stored. There is nothing worse than showing up to a storage facility and realizing that they are closed and you can’t get in. If you can’t get to your stuff when you need it, it’s not good self-storage. Storage World has 24 hour access to your units, so you can visit at your convenience. Does the thought of paying for storage make you wince? Traditional self storage in Atlanta is often expensive. Renting a portable unit gives you convenience plus a lower cost, keeping you and your budget happy. A traditional Georgia storage unit means that you must pack your items, transport them to the storage facility, and then do it all over again when you empty the unit. With a portable storage unit, we bring the unit to you. You pack the ground-level unit on your schedule, and then you call us to pick it up. We use our patented horizontal lift of our atlanta storage containers to carefully pick it up and move it wherever you specify – to your new home or to one of our many facilities. What could be more convenient than that? Storage World on Wheels has the safety, convenience, 24 hour access, and the price you need to banish those “storage woes” and make moving the pleasure that it should be.